Tests were performed with Kodak GP-1, GP-2, and with GP-2 minus the gold chloride on Ilford Warmtone FB developed in Dassonville D-3 for 3 minutes 15 seconds. Toning was with 50ml toning solution per print, each print being 6x2 inches. 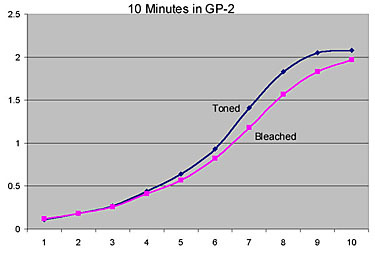 Bleaching was accomplished with 50ml Kodak R-21A chromic acid reversal bleach in 950ml water (2.5 g Cr2O7 + 2.5ml H2SO4 in 1 liter of water). 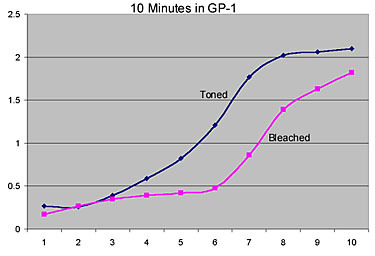 Bleaching time was 60 seconds, followed by 60 seconds in a 10% bisulphite clearing solution, followed by a 15 minute wash. 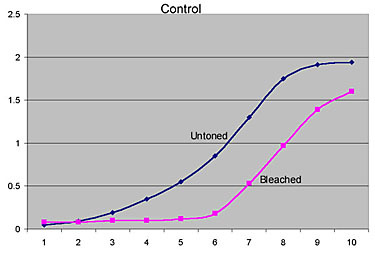 The chromic acid bleach test is an attempt to simulate a severe oxidative attack. One would hope that a fine print would never be subjected to such severe oxidation, but it is nonetheless instructive to know how it would fare under such an attack. 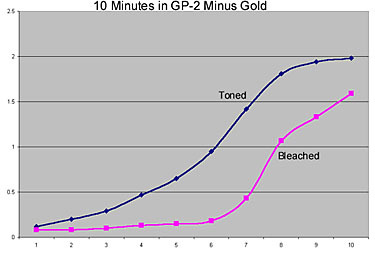 The benefit of toning with GP-2 is clearly illustrated, as well as the superiority of GP-2 over GP-1 for archival purposes. While the Image Permanence Institute at RIT has found that GP-2 without the gold provided just as effective protection for microfilm, that does not appear to be the case with the paper tested. For archival purposes, the advice with GP-1 & 2 is to tone until a just-perceptible change in tone occurs, compared with a wet, untoned print. On Ilford Warmtone FB this seems to be at about 2-3 minutes in GP-2, which should afford considerable protection, but longer times are even better. The "blueness" produced by toning is less noticeable when prints are dry, but the tone of dry, toned prints is distinctly colder than in untoned.